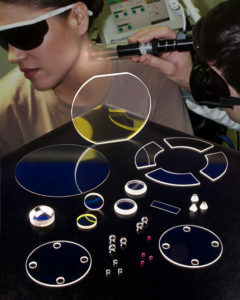 Sapphire Single Crystal Sapphire substrates are ideal for epitaxial deposition of GaN and other III-V and II-VI thin-films for use in the manufacture of bright blue and green LED’s. C-axis  oriented wafers are available in the sizes shown below. One side is highly polished to 1 nm or less and the second side is either fine ground or optically polished. The parts are available in lots of 10 or 25 in cassettes packaged in Class-100 clean room under nitrogen and are EPI ready. Sapphire Substrates are custom fabricated to order and typically require a 1 week lead time. Orientation  C-axis, +/- 0.2 deg. C-axis, +/- 0.2 deg. Primary Flat  A-axis +/- 0.3 deg. A-axis +/- 0.3 deg. Sapphire Substrates are custom fabricated to order and typically require a 1 week lead time. Quantity discounts are available. Contact Us for more information.